The National Media Council has selected architect Santiago Calatrava’s design for the UAE Pavilion for Dubai World Expo 2020. 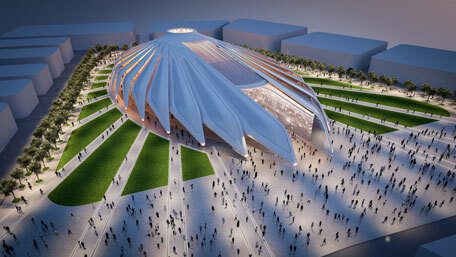 Located facing the Al Wasl Plaza, which lies at the centre of the 200-hectare exhibition zone, the UAE Pavilion – whose design will be inspired by a falcon in flight – will represent the UAE to the 25 million visitors and participants from over 180 nations who are expected to visit the Expo from October 2020 to April 2021. Santiago Calatrava’s proposal was formally selected following a seven-month design competition managed by Masdar, Abu Dhabi’s renewable energy company, in its capacity as program manager. The contest saw nine of the world’s most renowned architectural firms submit 11 concepts. Each design was evaluated against specific criteria, including how fully the design expressed the main theme of Expo 2020 “Connecting Minds, Creating the Future” and how well it captured a distinct Emirati feel and a balance between the UAE’s past and future. The pavilion is expected to cover up to 15,000 square meters and will include numerous exhibition areas, an auditorium, food and beverage outlets and VIP lounges. It will be designed to embrace sustainable building principles. Masdar was appointed program manager by the National Media Council for the UAE Pavilion on the basis of the renewable energy company’s track record of successfully delivering highly innovative and sustainable projects, including the LEED Platinum-certified Siemens Middle East Headquarters.